Since 1957, the Myron L® Company has designed and manufactured highly accurate and reliable analytical instruments for a wide variety of demanding applications. Thousands of professionals around the world rely on the performance of our instruments every day. Uses range from boiler water testing to ultrapure water control to medical instruments for artificial kidney machines. We are proud of the trust our handheld instruments and monitor/controllers have earned. Some of our instruments have been in continuous use for over 45 years. Our latest digital handheld, the Ultrameter III 9P, is based on the tried and tested design of the Ultrameter II. 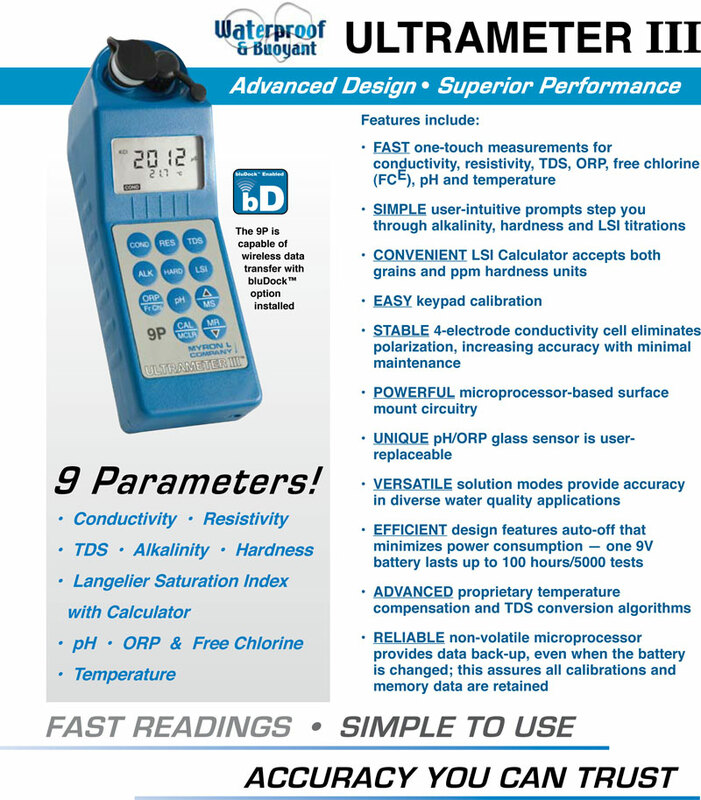 The 9P adds the ability to perform in-cell alkalinity and hardness titrations either as stand-alone measurements or as part of an LSI calculation. Alkalinity, hardness, pH and temperature values can be manipulated in the LSI calculator to predict the effect of changes on water balance. Measurements are extremely accurate. And the 9P is simple to operate and maintain. The Ultrameter III features both an LSI Calculator and an LSI Titration measurement mode. The Calculator allows you to perform what-if scenarios to predict how changes in solution parameters would affect the water balance of a system. The titration measurement function allows you to accurately calculate a saturation index value of a specific solution to determine whether the solution is balanced, scaling or corrosive. The Hardness titration, LSI Titration and LSI Calculator functions allow you to set the hardness unit preference to either grains of hardness or ppm CaCO3. Like the Ultrameter II, the Ultrameter III delivers exceptional accuracy of ±1% of reading (±.1% at calibration point). 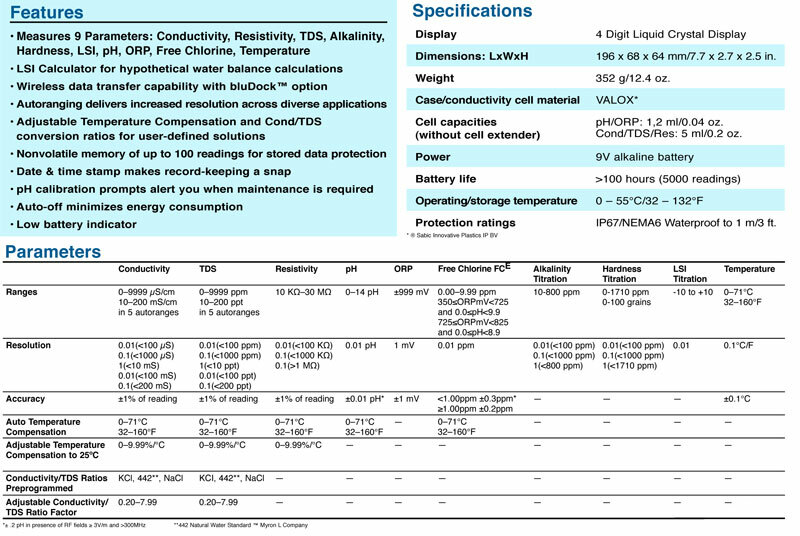 This high level of accuracy is achieved through advanced four-electrode conductivity cell technology, a powerful microprocessor, proprietary circuit design and conversion algorithms for three of the most common solution types, as well as a unique pH/ORP sensor. With displayed values of up to 9999, the full four-digit LCD ensures resolution levels never before possible in such affordable instruments. For accuracy in diverse applications, Ultrameter III allows you to select from 3 solution modes that model the behavior of the most common solution types: KCl, NaCl and 442™ Natural Water. Additionally, the Ultrameter III features a user adjustable conductivity/ TDS conversion ratio for greater accuracy when measuring solutions not contained in the microprocessor. 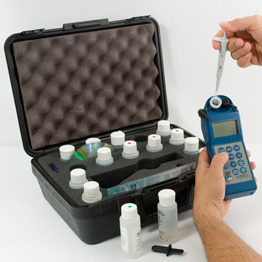 Factory calibrated with NIST traceable solutions, each Ultrameter III may be supplied with both certification of traceability and NIST traceable solutions for definitive calibration. Temperature compensation and range selection are both rapid and automatic. User adjustable temperature compensation (up to 9.99%/°C) can also be disabled for applications requiring non-compensated readings. Digital results display instantly. Measurement is continuous, displaying real-time readings rather than a static snapshot of the solution. AHL Titration Kit with hard protective case includes 9P; cell extender; titration plunger, 100μL pipette; 12 tips; 3 buffers (pH 4, 7, and 10); pH/ORP Sensor Storage Solution; ORP Conditioner Solution; titration reagents H2SO4-1, HCl-3, NAOH, EDTA-LC, EDTA-HC; Alkalinity Standard 100; Hardness Standard 200; standard solutions KCI-7000 and 442-3000. All bottles are 2 oz/59 ml. AHL Titration Kit can be ordered with the bluDock Accessory Package, as well. Soft protective case constructed of padded Nylon features a belt clip for hands-free mobility. Certificates confirming the NIST traceability of an Ultrameter III are available (must be specified when placing instrument order). Standard Solutions are necessary to maintain accuracy and for periodic calibration of conductivity and TDS parameters. All Standard Solutions are NIST traceable for your complete confidence. Recommended values: KCl-7000 (conductivity), 442-3000 (TDS). Hardness and Alkalinity Reagents and Calibration Solutions are required for alkalinity, hardness and LSI titrations. pH Sensor Storage Solution available in 2 oz/59 ml, 1 qt/1 L, and 1 gal/3,8 L.
Replacement pH/ORP sensor user-replaceable; features a unique porous liquid-junction. Myron L® M’Pet 100μL pipette. Replacement Tips for Myron L® M’pet micropipette. Bag of 48.
bluDock™ Accessory Package includes bluDock™ application software (PC only) for downloading data, dongle and printed instructions. All Myron L® Ultrameter IIIs have a Two (2) Year Limited Warranty. The pH/ORP sensors have a Six (6) Month Limited Warranty. Warranty is limited to the repair or replacement of the Ultrameter III only, at our discretion. Myron L® Company assumes no other responsibility or liability.